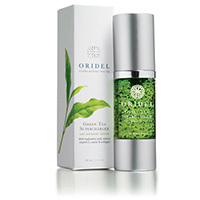 MTS Roller / Supercharger Combo - Oridel Ltd.
Buy any MTS roller by Clinical Resolution Laboratory and get Oridel Green Tea Supercharger Serum for topical solution FREE ($75 value)! CR2 (0.2mm) and CR3 (0.3mm) needles penetrate the skin with 0.2 mm (CR2) and 0.3 mm (CR3) and induce body own collagen in the dermal layers. The healthier the skin is made from topically applying products and treatments, the more difficult it is for the active ingredients in the products to penetrate into the skin. This is usually due to the stratum corneum becoming more compact and the epidermis becoming thicker. Generally, only minor fractions (maximum 0.3 %!!!) of the active substance of cream, gel or lotion can penetrate the surface of skin. It means the majority of active ingredients, 99.7%, is wasted because it didn’t penetrate deeply enough. The poor penetration characteristic of active ingredients is a natural physiological reaction of the skin, and known by all experts. However, if you wish to benefit much more from your cosmetics and their ingredients and to overcome the epidermal barrier - to enhance the active substances into the deeper skin layers – we have the best possible solution: The Personal Micro-Needling Therapy System solution with MTS-Roller CR2 & CR3. WHAT IS THE BEST ABOUT MTS-ROLLER CR2 & CR3? It is a precision German-made instrument that will last for hundreds of treatments. MTS Roller made by Clinical Resolution Laboratory is the highest quality roller on the market today – only the MTS Roller is made from surgical quality Lexan (compare with other rollers made from ABS plastic or resin) and the highest quality surgical steel available in the world. Clinical studies have shown MTS (micro-needling therapy system) to be more effective than ablative treatments like laser resurfacing, dermabrasion, and chemical peel and just as effective as non-ablative treatments like IPL, CO2 laser, and Fraxel in stimulating collagen and elastin production to thicken the skin thereby erasing wrinkles and smoothing scars. 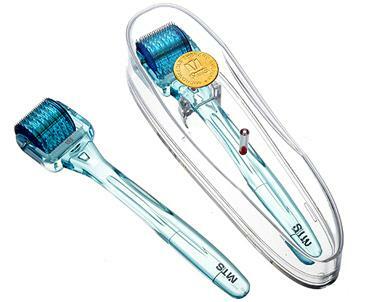 Micro-Needling Therapy System using the MTS roller causes multiple tiny pin point puncture “wounds” to the dermis. These dermal “injuries” induce the release of growth factors that simulates the production of new collagen and elastin. New collagen production is the goal of ALL skin resurfacing treatments. Micro-Needling creates dermal damage without removal of healthy epidermis, which happens with other resurfacing techniques. Because the epidermis is left intact, the healing process is rapid. The skin does not risk permanent structural damage, sun sensitivity, skin color loss or hyper-pigmentation. Step 2. Apply Topical Solution. Just before rolling we recommend the Oridel Green Tea “Supercharger” Serum as the Topical Solution which will greatly facilitate collagen induction. We achieve great results with the combination of MTS Roller and Green Tea Supercharger and our clients love it! Divide the treatment areas into sub-divisions. Roll the same areas vertically, horizontally and diagonally. Prevent lateral (sideways) movements while rolling, do not over apply pressure. Step 4. Re-apply Topical Solution. Apply the Topical Solution liberally to the treated area. Moisturizing and skin calming therapy is recommended: use two drops of Oridel Green Tea Supercharger Serum blended together with two drops of Oridel Liquid Gem Face Oil. Preventive sunscreens are also suggested. Note: We recommend using MTS Roller at night allowing skin to calm down an absorb Treatment Solution better. In the AM you can go back to your regular skincare protocol. Excellent treatment for upper lip lines, wrinkles, photodamage, scarring (acne) stretch marks, and post-surgical scars on face and body. Can be performed on all skin colors. Please Read Before Using MTS Roller with "your own cosmetics". 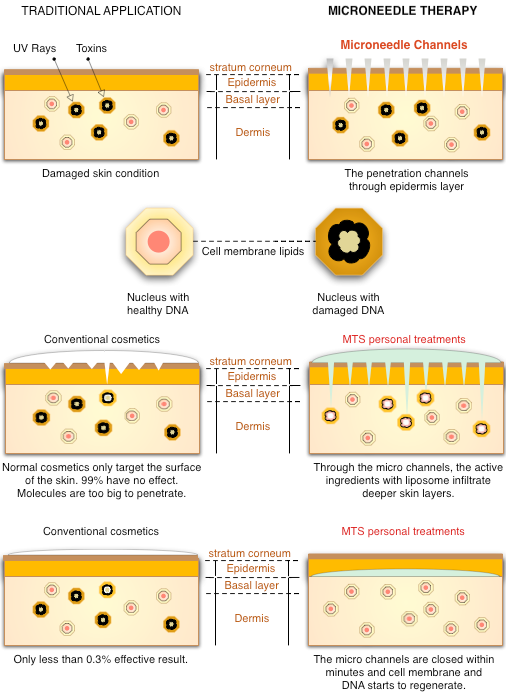 Keep in mind that many skin care products are harmless on the skin, but may react differently when infiltrated through the epidermal barrier. If there is any doubt the ingredients in your skin care products are suitable for infiltration, please consult a competent skin care specialist. When you move the roller on your skin - even without any skin care products - you'll notice a mild redness. This is the visible sign that the fine micro points have penetrated the epidermis. In general this redness will disappear within one or two hours. The perforated stratum corneum will close within minutes. If the MTS Roller is used in combination with skin care products, this can influence the intensity and duration of the redness. In any case, we will not be held responsible for the reactions caused by any active substances in the selected skin care products used in combination with the MTS Roller. Click the button below to add the MTS Roller / Supercharger Combo to your wish list.